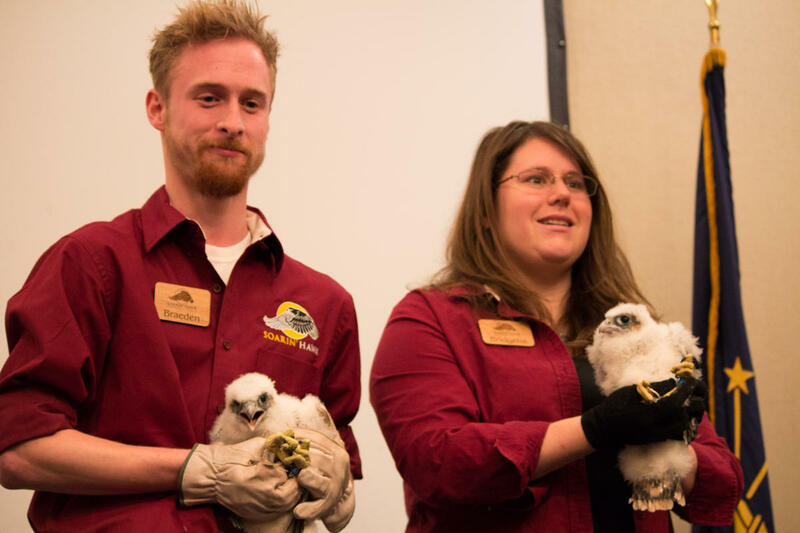 Zazu and Mist, two of the city's newest Peregrine falcons, are presented to a group of children at the Indiana-Michigan Power building by volunteers from Soarin' Hawk Raptor Rehabilitation Center. Their brother, Thunder, is banded nearby. 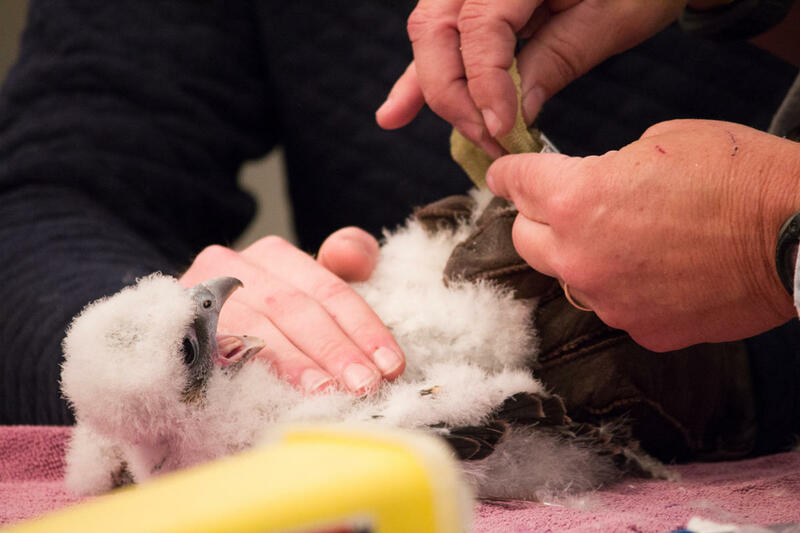 School children met Fort Wayne's newest Peregrine falcons atop the Indiana-Michigan Power building Friday, as biologists banded the birds by placing a small cuff with a tracking number on their legs. Pam Whitacre, a volunteer with Soarin' Hawk Raptor Rehabilitation Center, says its goal is to protect the birds from endangerment. In the state of Indiana, there are about 15 Peregrine nests and 50-60 falcons are banded every year. Banding helps conservationists track the birds in case of injury. Mist unfurls a mighty screech as John Castrale, a retired bird biologist from the Department of Natural Resources, bands her. Despite the sound, banding doesn't hurt the falcon chicks and doing so helps biologists track them. One bird banded in Illinois was later found at a church in San Jose, Costa Rica. Here, biologist John Castrale explains the difference between male and female falcon chicks. Indiana Michigan Power and the Indiana Department of Natural Resources invite school children to watch the banding every year, says communications representative Tracy Warner. The three chicks were born early April and will stay in their box nest for the next couple weeks until they learn to fly. Prior to the event, the children vote on names for the chicks. Zazu, Mist and Thunder are this year’s birds. Student Israel Mondragon eagerly watched the banding from the front row.